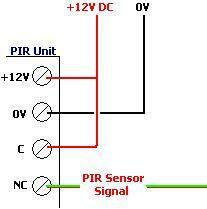 Buy of 12V PROGRAMMABLE PIR TIMER 3A. We have been selling our PIR Relay Timer now for five years and it remains one of our best sellers. We are however frequently asked for bespoke modified versions which can be programmed more simply and accurately, which have a 12V output for direct connection to lighting etc or to the purchaser’s own relay, and which are a bit smaller in dimensions. The product pictured above for sale here includes all three of those requested features. This timer is designed for use with the 12V DC Honeywell IS-215T passive infrared motion sensor which we sell in the REUK Shop, and most other burglar alarm type PIR sensors (which output a high signal when NOT detecting motion, and no signal when detecting motion). It enables you to control lighting and other devices which need to kept on for a particular period of time after motion has been detected. The user can programme this timer to keep its output ON for 10,20,30,40,50…etc seconds as per their requirements. The board is only 45mm x 45mm x ~20mm in size. This timer does not have its own relay. Instead there is a 3A rated 12VDC output*. If a larger current is required or if mains voltage is to be switched in response to motion then the user can add their own relay (12V coil relay or solid state relay) as per their requirements. * The connection diagram does not show it clearly, but the input side is the left and the output side is the right – i.e. 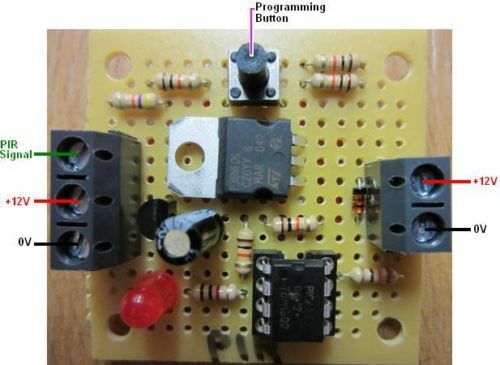 connect 12V power source and PIR sensor signal in to the left side of the board, and the 12V output will come out of the right side of the board after motion is detected. Programming this timer is as follows. Press and hold the programming button for more than one second*. The red LED will light up. Release the button, and after two seconds the red LED will turn off. Now press the button X times where 10 times X is the number of seconds you want the lights or other connected device to be ON after motion is detected – e.g. press the button 5 times for 50 seconds. Five seconds after your last button press, the LED will blink X times to confirm successful programming. The time you program in will be retained in memory and NOT lost when/if you disconnect the 12V power supply or battery from the timer, therefore you only need to re-programme if you want to change the setting. *If you press the button for less than one second then the red LED will flash X times to show you what the currently programmed setting is without changing that setting. If using an alternative sensor, follow the instructions provided with that sensor and connect the PIR sensor signal from it to the timer board. In normal operation, while motion is being detected by the PIR sensor the red LED will be lit and the the 12VDC output will stay on for the user set time interval. If motion is detected while the output is already ON due to a previous recent motion detection event, the timer will begin its count down from the start again and the output will remain ON. Click here to see how multiple PIR sensors can be connected to one of these timers so that motion events from multiple locations (e.g. either end of a corridor, or all the way up a stairwell) can be dealt with: Connect Multiple PIR Sensors Together. NEW – If you would like to have this product, but with the addition of manual override functionality (so that you can still easily turn on the devices connected to the output), click here for information about a modified version of this controller: 12V Programmable PIR Timer with Override. If you have any questions about the operation of this circuit and our 12 Volt DC PIR Sensors please contact neil@reuk.co.uk directly by email. Also contact us if you need any modifications to this device – changing the timing regime, connecting multiple PIR sensors or different types of PIR modules to it, and so on.